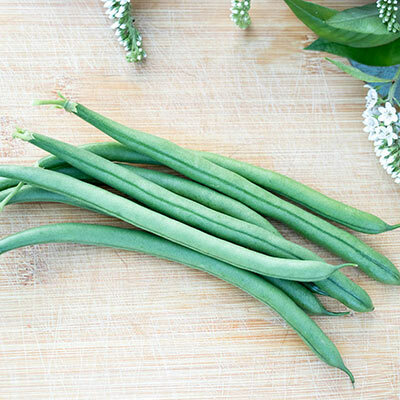 Seychelles Pole Bean is a high-yielding variety that produces a large crop of 5-6 inch, long, slender, straight beans. They contain very small seeds and have a pleasingly crisp texture. The crop matures early and is very flavorful—it's easy to see why Seychelles was chosen as an All-America Selections Winner. Seychelles can easily be grown in containers if space is limited, just be sure to provide a support for vines. Place poles, teepee, trellis or other support when the plants have 2-4 leaves. Seychelles Pole Bean is resistant to anthracnose and bean common mosaic virus. 55 DAYS. Spacing: Plant seed 1 inch deep (deeper if soil is dry), in hills of four to six seeds at the base of each pole. Plant 3 inches apart in rows along the base of linear trellis. Foliage: Vigorous, dark green vines. Pruning: It is beneficial to prune the growth above the trellis or stake to promote a fuller plant and pod set at the base of the stems. Fruit: Very uniform, straight, slender, 5-6 inch, stringless dark green pods with very small seeds.